Thomas began his career with Bredebro IF and FC Sydvest before signing for Danish 1st Division side Vejle Boldklub in 2010. 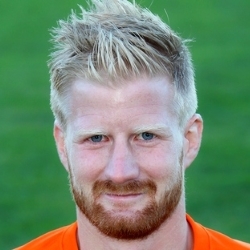 The striker spent three years at the Jutland Peninsula side, during which time the club merged with Kolding FC. In 2013 he joined FC Fredericia, scoring regularly during his one year spell there, before attracting the attention of Danish Superliga side Odense Boldklub, signing for OB in August 2014. After making 11 appearances in the Superliga, Thomas was loaned out to IFK Göteborg in March 2015, before returning to his parent club in the summer. The 6ft 2” Dane was loaned out to his former club Vejle BK for the 2015-16 season, and performed well there. However on his return to OB he found it hard to break back into the side. In January 2017 United secured the loan signing of the 26-year-old striker, and he made his first team debut that day. Thomas was born on this date in Denmark. 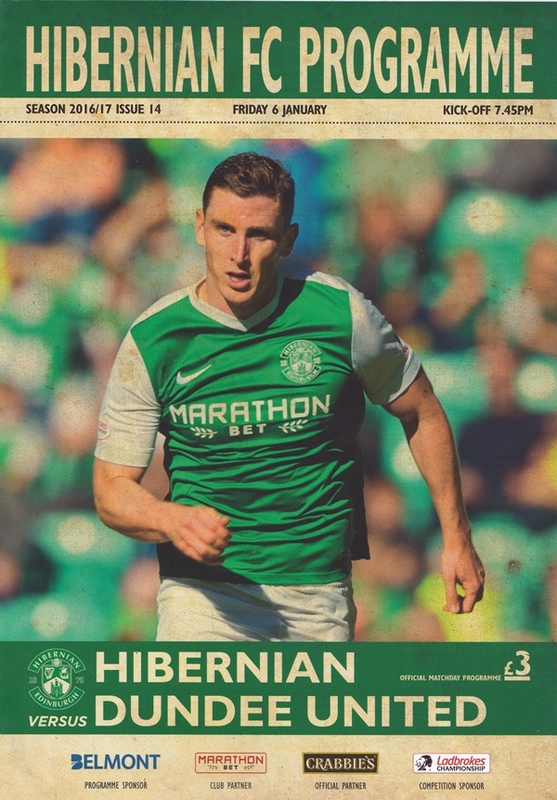 Hibs started the game at a frantic pace, utilising an attacking formation with Humphrey, Boyle, Cummings and Kris Commons, all pressing United in their own half for much of the opening period. Humphrey showed his pace and intention to attack Paul Dixon as early as the 2nd minute, leaving the United full back in his wake as he twisted and turned to ping a dangerous cross into the box. Hibs took a deserved but slightly fortuitous lead on six minutes. A second corner, in quick succession, was headed out of the United area but only to the onrushing Humphrey; his weak shot managed to find its way through to Jason Cummings and he knocked the ball past the helpless Bell from six yards out. United were in trouble again minutes later, Murdoch short with a pass back was helped out by a stretching Edjenguele who got to the ball just before Cummings could benefit. Mark Durnan then caused further anxiety in the away end, slicing a clearance that put Cammy Bell under pressure. Toshney then made a brave clearance as Commons unleashed a fierce strike from twenty yards as it looked like Hibs would run riot. United failed to get any hold in the game, and even when they did get forward the final ball was left wanting as first Andreu and then Van der Velden wasted opportunities to put pressure on the Hibs defence. Hibs doubled their advantage on twenty six minutes, again with a hint of good fortune. McGregor made a crunching challenge on van der Velden; his clearance fell into the path of Humphreys and his clever touch took him clear of Dixon. He rifled in a low cross leaving Jason Cummings the simplest of tasks to tap home. Telfer was booked for a late tackle as the frustration in the United midfield became obvious. An offside flag then spared further blushes in the United rear guard as McGeouch’s clever run and slick pass sent Cummings clear on goal, only to be called back thanks to the assistant referee’s decision. A minute before the break Murdoch clattered into Barkley in the middle of the park to earn a caution from the referee. The first quarter of the game passed without incident with both sides struggling to establish any fluency in their play. 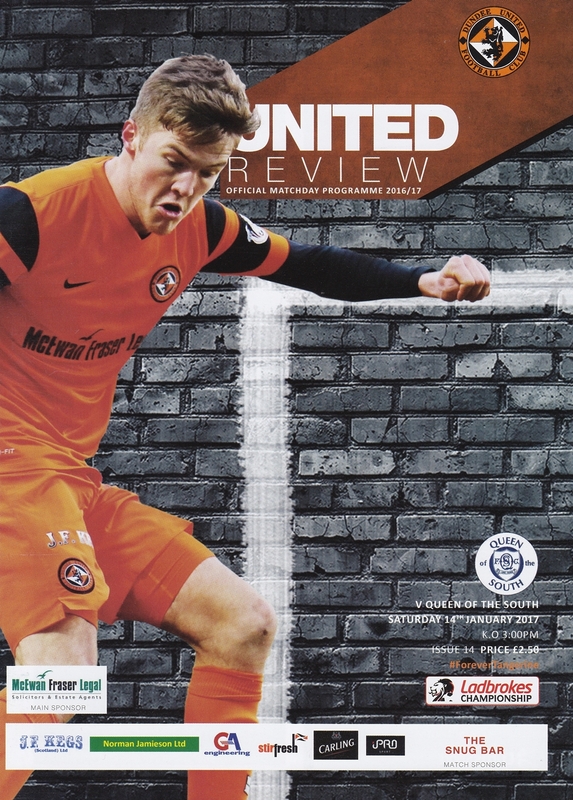 It wasn’t until the twenty-fourth minute that United managed to create a half chance when Blair Spittal played a great ball into Simon Murray who found space well inside the Raith penalty box but Kyle Benedictus was there to dispossess Murray of the ball and clear away the danger. The next chance in the game fell to the visitors albeit as it was only a half chance when a Kevin McHattie’s free kick from the left-hand side was floated in to the box and nodded back across by Benedictus and it was Declan McManus with the header over the bar. United finally found the breakthrough much to the delight of the home fans on the forty-fifth minute when Scott Fraser had a free kick on the right-hand side of the box that substitute keeper Conor Brenan got a touch to but fell to Paul Dixon on the left-hand side of the box. His floated cross to the near post was met by Thomas Mikkelsen who nodded home from six yards for his first goal for United. Three minutes of madness saw Dundee United turn a comfortable 2-1 lead into a 3-2 defeat against Livingston in the first leg of the Premiership playoff semi-final at Tannadice. Although United only had 72 hours to prepare for the game after their victory over Dunfermline, the late collapse certainly could not be attributed to tiredness as late defensive lapses saw United lose a game they had looked in control of.